Our cooking competitions are designed for occasions when a regular cooking class just isn’t enough. They are perfect for a team or a family whose comradery has a competitive edge. 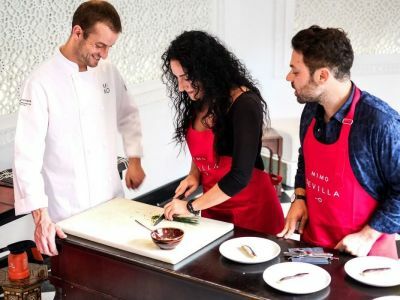 Your group will be divided into teams and faced, Masterchef style, with a wall of Sevilla’s freshest ingredients. Your task? With these ingredients and a bit of culinary direction, teams will craft their very own bar of tapas. This experience is incredibly fun and just the right amount of challenging. Our team of experts and locals will rate the resulting tapas, and the winning team gets a prize. After the competition, however, everyone will feel like winners as they gather together around the bar of homemade tapas. If your team is anything like those who have visited, this could very well become an annual tradition. 10:00AM (morning competition) or 18:00PM (evening competition) Our 4h cooking competition/class will take place at one of the best cooking schools of the city, located in the city centre.